AKA: General Electric 1963 Mars Expedition. Status: Study 1963. Payload: 88,000 kg (194,000 lb). Thrust: 580.00 kN (130,380 lbf). Gross mass: 880,000 kg (1,940,000 lb). Unfuelled mass: 268,000 kg (590,000 lb). 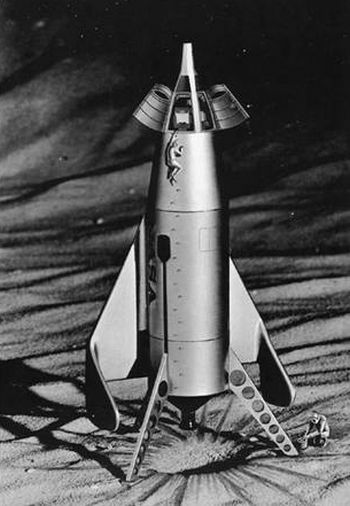 Specific impulse: 830 s.
There was a space pioneer by the name of Dandridge Cole. He had visions of mankind's expansion into space using asteroids as stepping stones. They would be sources of propellant and raw material as the human race expanded into the solar system. 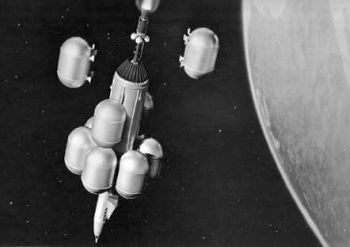 Using atomic explosions as propulsion and mining devices, they could be moved into earth orbit. There they could be hollowed out to create enormous human colonies. Versions could be sent on missions to other stars. They could also serve as non-nuclear weapons of mass destruction, virtual Damocles swords. Stationed in deep-space orbits, they would be braked by a single nuclear explosion to hit a selected target with a multi-megaton non-nuclear impact. Some of these ideas had been mooted by science fiction authors, but Cole did the engineering analysis to show they were workable. Cole's university education was interrupted by combat service in World War II. 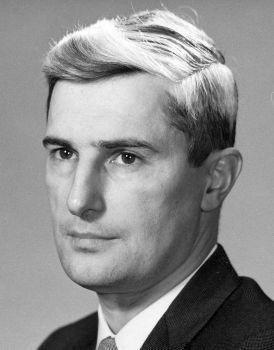 He first was an academic, but in 1953 began working for the Martin Company, being involved with design and development of the Titan II ICBM and space launcher. He moved to General Electric Valley Forge in 1960. He worked there as a consulting engineer until his untimely death in 1965 at age 44. Cole is virtually unknown today, perhaps because he was not around to promote his ideas in the 1970's when the space colonization crowd adopted a lot of them. In 2009 he was brought out of obscurity, when a descendent composed a comprehensive Wikipedia page on this life and works. In 1964 he published Islands in Space to popularize his ideas on the exploitation of asteroids to get humankind out into the solar system and beyond. This book made a big impression on young space cadets of the 1960's, particularly one illustration that showed astronauts climbing down a planetoid lander from what looked like a Gemini capsule! The source of this photograph was an October 1963 paper credited to another General Electric engineer, Thomas F Widmer, then Project Manager for Advanced Nuclear Spacecraft at General Electric Valley Forge. 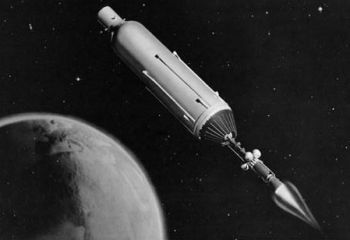 This described a mission to Mars with a crew of four using Nerva engines for nuclear propulsion and thermoelectric power generators. These were products in General Electric's hoped-for future product lines. 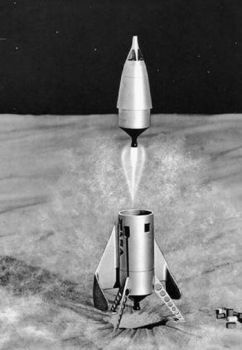 Widmer later managed development of the SNAP-27 RTG power sources used on the Apollo moon landings to power the ALSEP scientific stations. He finally moved on to Thermo Electron, being involved in its expansion from a small laboratory to a conglomerate that today dominates the scientific instrumentation industry. Valley Forge's Mars mission was one of several industry studies requested by NASA Houston in 1963 to determine the best approach for manned exploration of Mars. 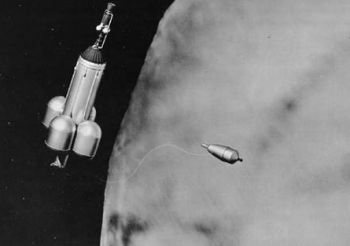 Widmer�s fast, brute-force approach involved assembly of the vehicle in low earth orbit; a propulsive burn towards Mars; propulsive braking into an eccentric Mars capture orbit; descent of two of the four crew in a chemically-powered lander towards the surface; aerodynamic braking followed by a rocket-powered final descent to the surface; return to of the crew in a minimal-mass ascent stage at the end of surface exploration; rendezvous with the orbiting nuclear spacecraft and transfer of the crew and samples by EVA to the mother ship; propulsive return to earth; and propulsive braking back to low earth orbit. A 400-day total trip time envisioned. The design was flexible, involving the use of a single nuclear thermal engine and a core LH2 propellant tank. 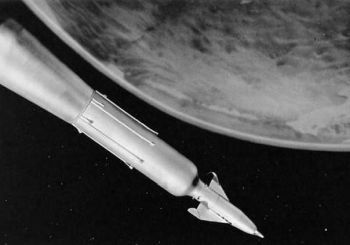 Differences in delta-V requirements to Mars at different launch windows would be accommodated by simply adding the necessary number of additional propellant tanks around the core. It was calculated for the baseline 1973 launch window that the total delta-V would be 54,900 ft/sec (16.7 km/sec, requiring a starting mass of 880,000 lbs (400,000 kg). Additional tanks could accommodate the 1975, and 1984 windows. 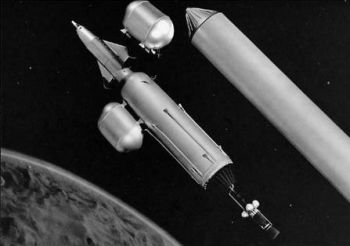 The unfavorable 1977, 1979, and 1982 windows would require the addition of an additional earth orbital launch stage. The crew living quarters, 34,650 pounds (15,750 kg), including 10,500 pounds (4800 kg) for a solar flare radiation shelter. 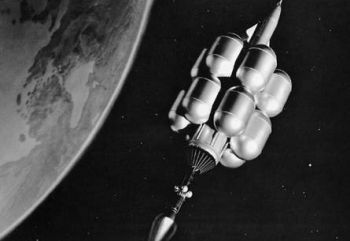 The living and working module was 22 feet (6.7 m) in diameter and 15 feet (4.6 m) long, with a total of 5000 cubic feet (140 cubic m) of living space. This was divided into a vehicle control center deck and a crew quarters deck. The Mars Excursion Module, 36,250 pounds (16,400 kg) total. This included the 24,200 pound (11,000 kg) return stage (including the 5200 pound (2400 kg) Gemini capsule and 17,300 lbs (7800 kg) of propellant for a delta-V of 17,500 ft/sec (5.4 km/sec). The 12,050 pound (5400 kg) landing stage included 5,000 pounds (2300 kg) of scientific payload. These masses were calculated for a ballistic heat-shield approach, although the version illustrated was a more glamorous winged version which would have weighed more. This was really a bare-bones approach. The mission produced only five days on the Martian surface. Hopefully the scientific payload included some kind of surface shelter for the two crew, otherwise they would have to climb up and down the side of the lander and try to sleep in their suits in their cramped Gemini seats every night. As would be expected, the main considerations of the paper were the nuclear aspects - the tradeoffs between one engine and multiple tanks versus multiple engine+tank stages, the type of space nuclear reactor or radioisotope thermal generators to use for power, and the design of the radiation storm shelter. 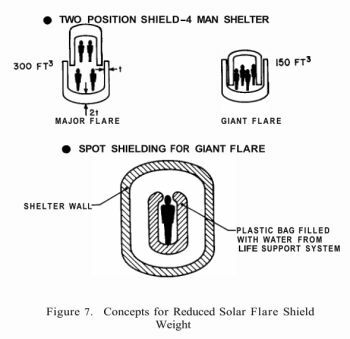 One ingenious approach had a 'collapsing' design that gave the waiting crew more space during a lower-intensity flare, then more protection and less space for a low-duration, high-intensity flare. Family: Mars Expeditions. Country: USA. Propellants: Nuclear/LH2. Bibliography: 13395, 13396, 13397.